his beautifully landscaped horse property is located on a cul-de-sac and is designed for comfortable everyday living, as well as entertaining. 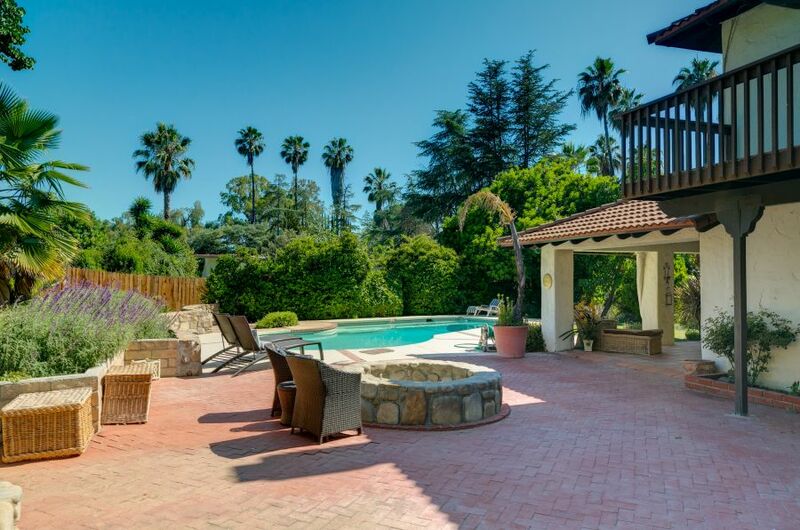 The custom-built, remodeled, Spanish-style home has four bedrooms and four bathrooms, including first-floor guest quarters that could easily be used as a second master suite. You enter this property by a circle driveway where you are greeted by garden areas, a river rock patio, a river rock bench nestled under a tree and a roomy RV parking area, all overlooked by the balcony that runs along the front of the house. As you step through the front entry, you have the kitchen and casual dining area to the left, and the living room to the right. In the living room, a corner gas fireplace crafted from river rock makes a becoming focal point and adds a cozy element to this roomy space for relaxation. A Saltillo tile floor and custom paint add to the atmosphere, and a glass slider leads to a covered outdoor entertaining area with the swimming pool beyond. The formal dining room, which also has Saltillo tile flooring and custom paint, is open to the living room so that dinner guests can enjoy the river rock fireplace as you dine. Wainscoting adds a touch of old-world elegance to this room, while glass sliding doors leading to an exterior patio make indoor-outdoor entertaining a breeze. Connected to the formal dining room is the kitchen and casual dining area. In the kitchen, you will find Saltillo tiles, custom paint, granite tile counter tops, a double oven, and a movable kitchen island with a granite tile top, pull out storage and a breakfast bar separating the kitchen from the breakfast area. A large garden window looks out over the impeccably landscaped backyard and lets in plenty of natural light. One of the home’s two master suites is also located on the ground floor and has a private entrance, making these luxury guest quarters an ideal option for those who need an inviting living space for aging parents, adult children returning home or long-term guests. This is also a comfortable master suite for those who simply prefer first-floor living quarters. The features of this room include a Saltillo tile floor, a corner fireplace with a brick hearth, a large walk-in closet with a skylight, and an en suite bathroom with cork floors, granite counter, travertine back splash and an over-sized travertine tile shower. French doors lead to a river rock patio with a rock sitting wall, and glass sliding doors lead to a separate patio area with the two-car garage beyond. The first floor also has a powder room off the entry, a storage area under the stairs leading to the second floor and a laundry room that leads to a mud room with a door to the backyard. On the second floor, you will find a guest bathroom with a tile shower at the top of the stairs, a linen closet, two guest rooms with large closets and Saltillo tile balconies, and the second master suite. This upstairs master suite has a large walk-in closet and an en suite bathroom with a double sink and Jacuzzi soaking tub, as well as two balconies. Glass sliding doors lead to the back balcony, which has Saltillo tiles, and views of the backyard and horse area. A second set of glass sliding doors lead to the large front balcony which also has Saltillo tiles and views of the front garden areas. While the remodeled interior was clearly designed with comfortable everyday living in mind, it is the outdoor living areas that truly set this home apart. Well-designed patios invite you to spend as much time as possible outdoors, including a covered tile patio off of the living room where you can dine outdoors, catch the big game on the flat screen television or chat with guests enjoying the adjacent swimming pool. An expansive brick patio makes larger gatherings an easy option, while a river rock fire pit adds to the ambiance for evening entertaining. There is also a covered wood deck and a built-in barbecue grill. All of the patios have custom lighting, and a mix of covered and open patios increases your entertaining options. There is even an additional covered area behind the two-car garage that can be used as a private patio or as an outdoor storage area. From this separately fenced, beautifully landscaped backyard with fruit trees and mature rose bushes, you can walk up the stairs leading to the horse area where you will find a barn, corrals and turnout arena. There is also a separate, gated driveway that leads to the horse facilities. 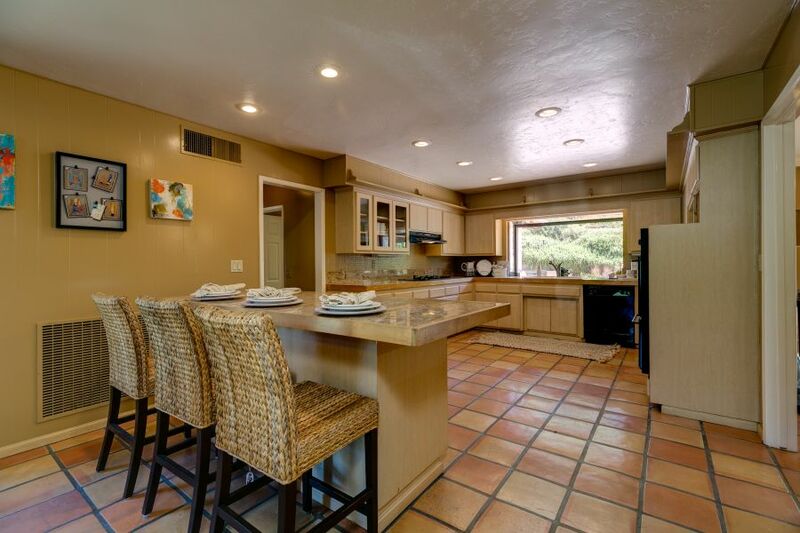 This is a fantastic horse property that offers exceptional outdoor living spaces for enjoying the great weather that Ojai experiences throughout the year. 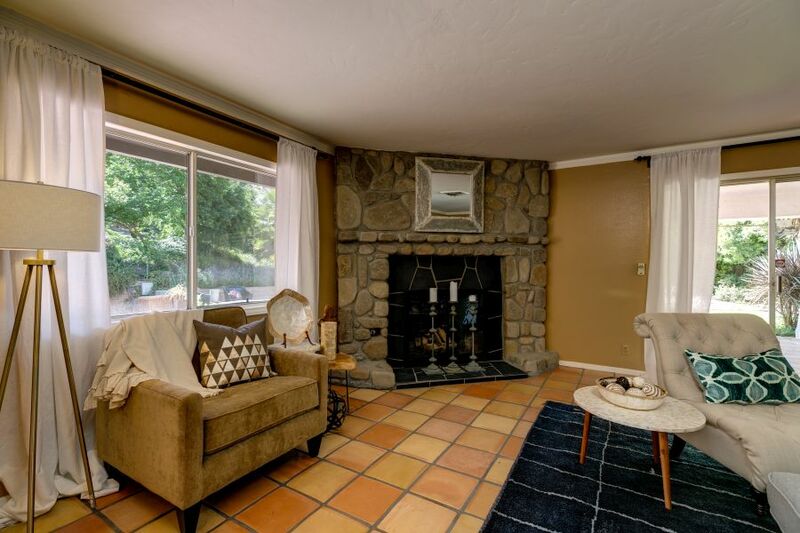 Just minutes from downtown Ojai, and just a short drive to the beaches and extended shopping and entertainment options in Ventura and Santa Barbara, this is your opportunity to experience country living like only the Ojai Valley can offer. 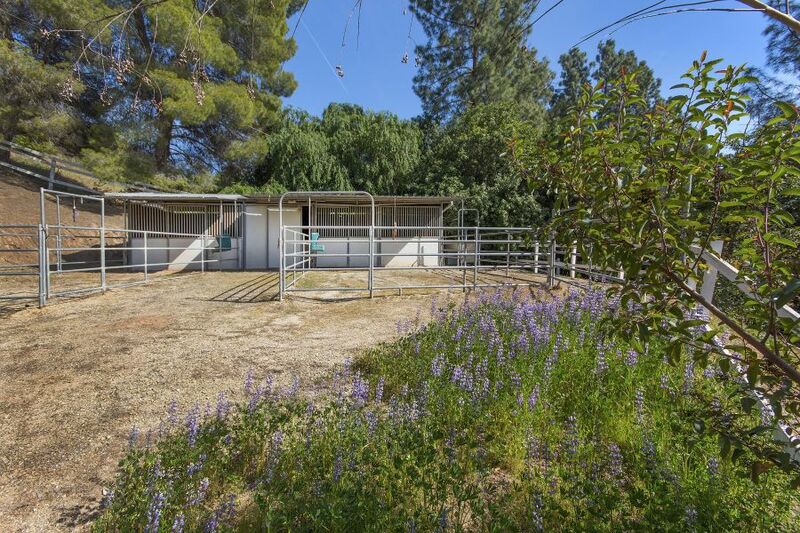 Find out more about this Ojai horse property for sale by contacting Nora today!